So, it’s half-term. While for those of us who work at home the thought of a whole week of the kids being around all the time, constantly moaning about being bored, arguing with each other and generally being annoying is enough to bring us out in a cold sweat (especially if your other-half happens to be a childminder!) it does have its upsides. My eldest’s football training takes a week off. Which means there’s no need to take him to training on a Tuesday evening. Which means extra time to indulge in a bonus spot of groundhopping. Yay. Having already been aware of this fact for a while now (half-term dates are indelibly etched into my memory – for all the wrong reasons) I already had the game I would be attending in mind. 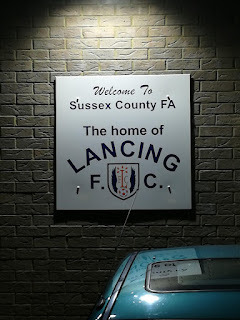 A visit to the Culver Road stadium, home of the Sussex FA, for the SCFL Premier League match between Lancing and Arundel. Looking to spread the joy that non-league football has brought me so far this season, I’ve started to ask a few friends if they fancy coming along with me on my jaunts – well, the ones my children don’t attend with me. I’m not cruel. This week, my call was answered positively by the same friend who’d accompanied me to the Southwick vs Bexhill game a few weeks ago. I’ll make a groundhopper of him yet! Unfortunately, the car park at Culver Road was full by the time we arrived and the surrounding roads were surprisingly busy. Still we found somewhere to park eventually and made our way to the ground, arriving about ten minutes before kick-off. 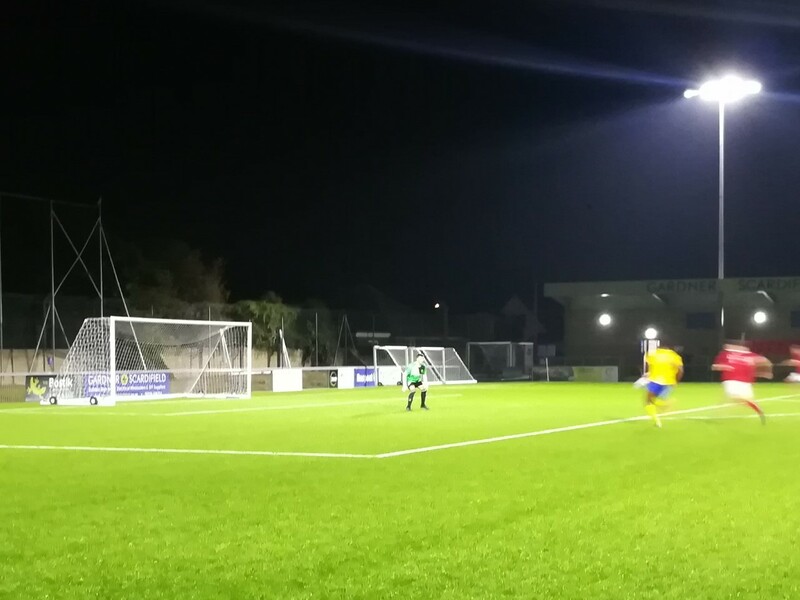 Given that Culver Road is, as already mentioned, the home of the Sussex FA, the facilities at the ground are far more luxurious than those found at most other grounds at this level. 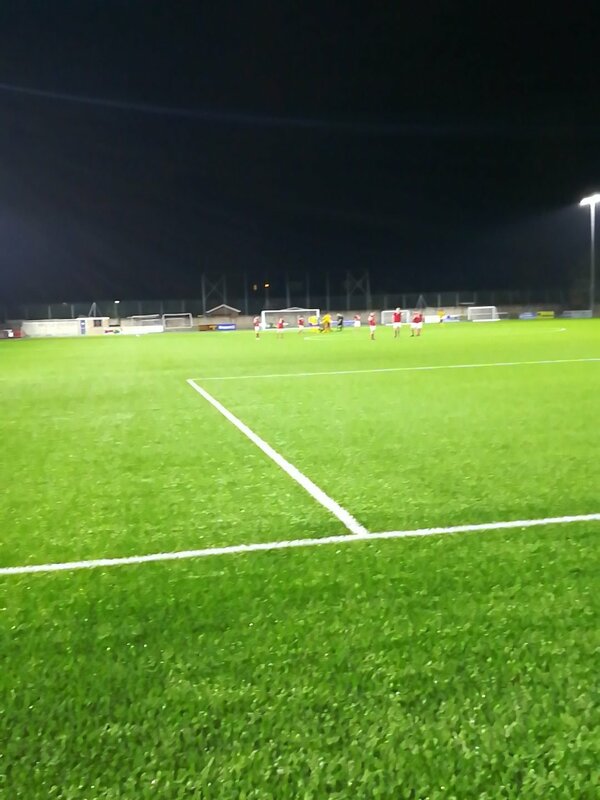 There’s an immaculate looking 3G pitch, the concrete built main stand is grand and the clubhouse is extremely well appointed. My friend, a Brighton season ticket holder, was pleasantly surprised to only be faced with a £6 entrance fee – and then amazed when he was able to purchase a burger and two teas for just £5.50. Welcome to the appeal of Non-League football, my friend. In addition to the entrance fee, I also purchased a decent paper program for £1, which worked out as good value for money. It included all the information one would expect from such a publication. Having been with me for a fairly one-sided game last month, I was secretly hoping that this game would be a barnstormer. 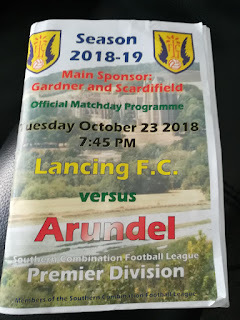 The type of game that would help prove that travelling around Sussex (and sometimes further afield) watching football matches between two random teams with which I have no affinity is not as crazy as it no doubt sounds to some. My wish was answered. Emphatically. In the early stages, the visitors took the game to the Lancers, and had two decent chances to take the lead in the opening ten minutes. The talented duo of Harry Russell and Ben Gray were causing the home defence all manner of problems. The opening goal duly arrived just before the quarter-of-hour mark, with Gray scoring from the penalty spot (see video) following one of the most stonewall penalties you are ever likely to see. Even at this early stage it seemed that Lancing were facing an uphill struggle as Arundel looked in complete control. 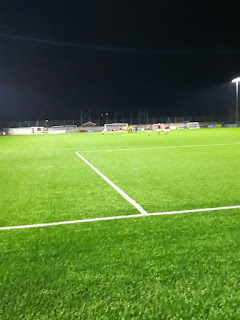 However, the hosts were handed a way back into the game just four minutes later, when for the second time in only a couple of minutes, the Arundel defence gave the ball away cheaply and needlessly in a dangerous area, and the extremely impressive Daniel Momah raced away to equalise. Then, on the half-hour mark, came the moment that looked set to decide the destiny of this match. A nasty looking, but completely accidental, collision between an Arundel forward and the Lancing keeper, Tyler D’Cruz, led to the latter being knocked out cold. It was the second such collision in the game. After a lengthy delay, the sensible decision to get him on a stretcher was finally made and he was taken to hospital. Hope he’s okay and back in action soon. With no substitute goalkeeper, midfielder John Lansdale had to don the gloves. And within minutes the Mullets were ahead – although in truth there was little Lansdale could have done to prevent it. Gray again was the scorer, this time with a curling low drive from an acute angle, that would have left most keepers helpless. 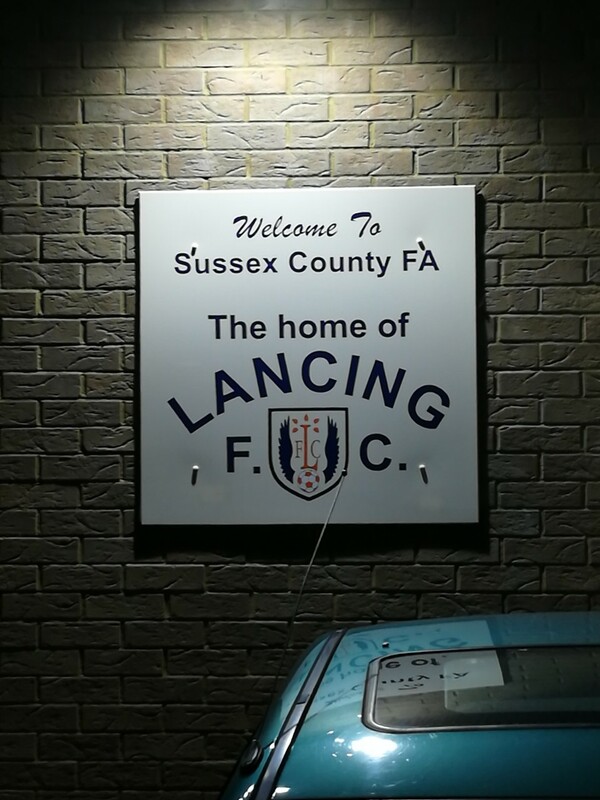 During the lengthy period of injury time at the end of the first half, Lancing briefly thought they were level. Momah pounced on a loose ball after Arundel goalie, Chris Cook, had saved from Jack Langford, only for the former to be ruled off-side. 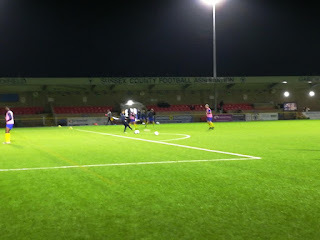 From the next attack, Arundel went two ahead, this time Russell was the scorer and again there was little the stand-in goalkeeper could do to prevent it. 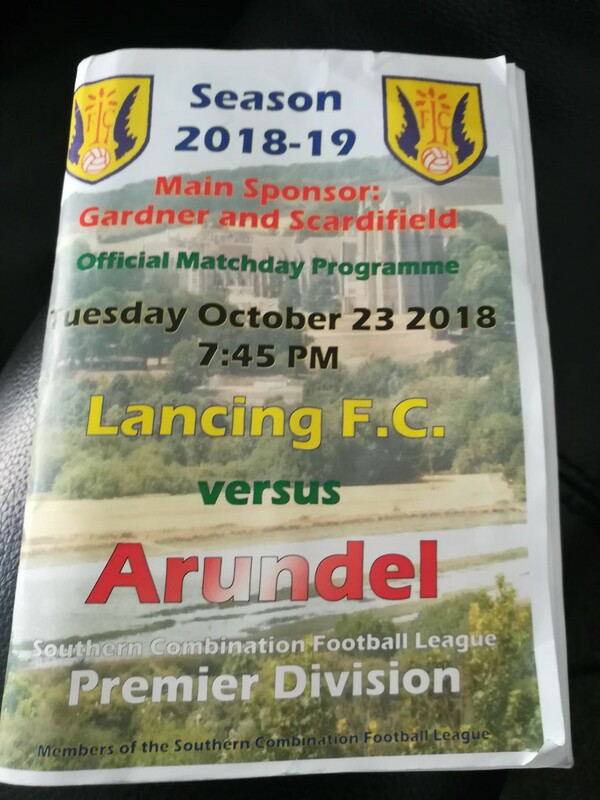 At half-time, my friend confidently predicted that the game would finish 5-2 to Arundel – a team he had been mightily impressed with and was genuinely confused as to why they were towards the bottom of the table. However, as his occasional acca bets and regular Super 6 performances will attest, he’s no expert predictor (not that I’m any better, mind you). Funnily enough, the real changing point of the match came with an injury to the Lancer’s danger man Jack Langford, who hobbled off with a suspected (self-diagnosed) broken toe. Up to this point, Lancing’s attacks had been rather one dimensional, with home players time and time again looking to switch play to get the pacey Langford in behind the Arundel defence. It was a tactic that was, on the whole, dealt with comfortably by the visitors. With Langford off the pitch, though, Lancing began to play with more purpose, moving the ball quicker and keeping it on the ground. When Momah got his second of the game midway through the second half, you could see that the Mullet’s defence was starting to get a little nervous. That said, there was more than a slice of fortune about the ensuing leveller and eventual winner. First, a speculative long-range effort from Brad Lewis looked to be fairly harmless, but somehow managed to deceive Cook to end up in the net. 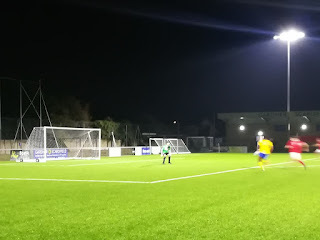 Then, minutes later, what was almost certainly a cross from Matt Daniel, sailed over the unfortunate goalkeeper’s head, hit the inside of the far post and crossed the line to ultimately give Lancing the win. For their part, Arundel will surely be disappointed that they didn’t work Lancing’s stand-in keeper more. Although they were denied a leveller by the post late on, I can’t remember Lansdale having to make too many saves. In fact, he spent most of the second half playing as more of a sweeper-keeper. Pep would have been proud. For me this was the third 4-3 match that I ‘ve seen already this season, and arguably the best of the bunch. My friend was genuinely impressed by the entertainment on show, and, indeed, by some of the quality. So much so that as we left we were already discussing possible next games to attend together. The lure of the Non-League is strong. Try it. You might just like it!